On the main level, you will find the Craftsman style, white oak staircase tucked discreetly beyond the grand foyer, which boasts a 20 ft vaulted ceiling. 10 ft ceilings grace the rest of the main level, where cabinetry and other millwork by Misani abounds. The generous kitchen provides the finest appliances (Wolf, Miele, Sub-Zero) and is flooded with natural light reflecting off sleek, Diamastone counter tops. The main kitchen is complemented by a generous walk-in pantry and a servery connecting it to the elegant dining room, and opens to a dedicated breakfast room. The breakfast room walks out to a covered terrace, complete with outdoor gas fireplace. The sophisticated den is adorned in paneling and built-in cabinetry. The second level offers 9 ft ceilings, 4 generous bedrooms with ensuite baths (all with heated floors) and a bright and inviting laundry room. The master bedroom features a vaulted ceiling, French door walk-out to the upper terrace, built-in cabinetry and a cozy fireplace. The master dressing room conveniently provides access to the laundry room, while the lavish master ensuite spoils you with a freestanding soaker tub and the privacy of a water closet. 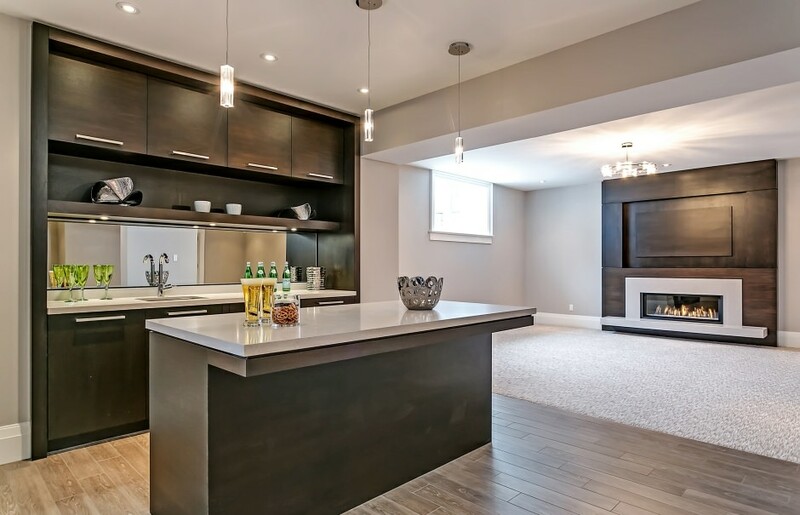 The bright and beautifully finished lower level with 9 ft ceilings provides radiant hot water heated floors and an open concept entertaining area featuring a fully serviced walnut wet bar, recreation room and games room. It further offers a fifth bedroom/nanny suite with full ensuite, an exercise room, finished insulated space for a wine cellar, a wired theatre room and plenty of storage space. The 3-car tandem garage is fully drywalled and features pressure treated baseboards. Ideally located within Oakville’s prime Morrison area, with all the fine schools and amenities the area is known for.